Wanderley, M.G.L., Sellaro, M. &amp; Moreira, B.A. (2009). Neotropical Bromeliaceae. Herbaceous and evergreen , or rarely shrubby perennials (Deuterocohnia); terrestrial, saxicolous, or epiphytic ; three patterns of growth, sympodial branching with determinant ramets, monocarpy, or monopodial with axillary flowering; stem usually very short and hidden by sheaths, sometimes long (many Tillandsia species) or rarely columnar, gigantic; there are species that live in isolation, or form extensive colonies, dense or sparse clumps, most grow towards the light, but others turn towards the ground (Tillandsiareclinata E.Pereira & Martinelli); roots functional but serving merely as holdfasts in many epiphytic species, reduced both structurally and functionally, or completely lacking. Leaves spirally arranged, usually rosulate or distributed along a stem , distichous in few species, in a wide variety of colours, shapes, sizes, and textures, simple , with margins entire or spinose- serrate or serrulate , rarely deciduous and heterophyllous (some Pitcairnia species), generally leaf sheath wider than the blade ; almost always bearing minute multicellular structures consisting of a stalk and a shield called peltate scales or trichomes, serving to absorb moisture and nutrients, sometimes hairy, or appear to be covered with an epicuticular powder wax. Inflorescence terminal , rarely lateral or pseudo- lateral , scapose or sessile , simple or compound , panicles, racemes, spikes, head -like, or solitary pseudo- lateral flowers, usually bearing brightly coloured conspicuous bracts, coloration of inflorescence may fade in a few days, or last for months. Flowers diurnal or nocturnal, sessile , or pedicellate, perfect or sometimes functionally unisexual, regular or nearly so, normally trimerous; perianth heterochlamydeous, 3 sepals are twisted left (sinistrorse) and 3 petals twisted right (dextrorse), free or connate forming a basal tube of varying length; sometimes inner surface has double longitudinal ridges, or double strap-shaped appendages (ligules), located at the base of petals, generally membranaceous, or fleshy , and takes a number of shapes; androecium 6 in 2 series, inner facing petals and outer facing sepals; filaments rounded , flattened or thin, free , or joined to petals or to each other; anthers dorsifixed or basifixed, with 2 locules and 4 pollen sacs that open through a longitudinal slit to release pollen ; gynoecium a single pistil of a trilocular ovary , trifurcate stigma usually spiral-conduplicate; ovary superior to inferior, 3-carpellate and 3-locular; ovules obtuse to long caudate ; placentation axile , extending length of cell or variously reduced. Fruit capsular, septicidal , or indehiscent but then hard and never pulpy or baccate , berries flaccid and often sweet. Seeds winged with entire appendage , plumose with an appendage at base or apex (or both) or naked; embryo small, situated at base of copious mealy endosperm ; seeds generally abundant, as well as offshoots (underground rhizomes, aerial stolons). Bromeliads are typical plants of the New World. Most of their species are found in tropical and subtropical latitudes of the Americas. They inhabit practically all the ecosystems found in the region stretching from Virginia and Texas in the United States to the central part of Argentina and Chile. The sole exception in a distribution pattern that is almost exclusively Neotropical, a single species, Pitcairniafeliciana (A.Chev.) Harms & Mildbr., has been found in Guinea, in Western Africa. A few species are found on islands in the Pacific (Racinaeainsularis (Mez) M.A.Spencer & L.B.Sm. of the Galápagos Islands, and Greigiaberteroi Skottsb. and Ochagaviaelegans Phil. of the Juan Fernandez Islands, in Chile). The richest Brazilian ecosystem in quantity and diversity of bromeliad species is the Atlantic rainforest, followed by high-altitude grasslands campos rupestres vegetation distributed along the Cadeia to Espinhaço in Minas Gerais and Bahia, sandy coastal plains, grasslands on rocky soils, caatinga and certain parts of the Amazonian forest. Other ecosystems such as the mangrove swamps and the Pantanal wetlands have a more modest presence of bromeliads. Genera with more than 100 species are Aechmea (231), Dyckia (125), Guzmania (184), Neoregelia (109), Pitcairnia (357), Puya (199), Tillandsia (544), and Vriesea (250). Twenty-six genera have 10 species or less, and eight of those have a single species. Aechmea: From the Greek "aichme", (a spear). Leaves usually forming a tank, spinose-serrate; scape usually well developed; ovary wholly inferior; fruitbaccate. Dyckia: For Prince Joseph Salm-Reifferscheid-Dyck, German (Prussian) botanist and horticulturist (1773-1861). Rhizome thick, often repent; leaves densely rosulate, blades pungent, attenuate. Guzmania: For Anastasio Guzman, Spanish pharmacist and naturalist. Leaves densely polystichous, entire margins; inflorescence mostly branched or simple, its branches polystichous-flowered. Style elongate. Neoregelia: For Edouard August von Regel, director of St. Petersburg Botanic Gardens in Russia (1815-1892). Leaves densely rosulate, usually spinose-serrate; inflorescence central, sunk in the centre of the rosette, simple in most species, very densely capitiform, umbellate or corymbose. Pitcairnia: For Dr. William Pitcairn, English physician and gardener (1711-1791). Leaves fasciculate or in a dense spiral along the stem, mostly polystichous; petals usually slightly zygomorphic and convergent over the stamens. Puya: From the Mapuche Indian (Chile) word meaning 'point'. Leaves densely rosulate, coriaceous; almost always coarsely spinose-serrate; petals generally spreading at anthesis, afterward twisted together in a spiral. 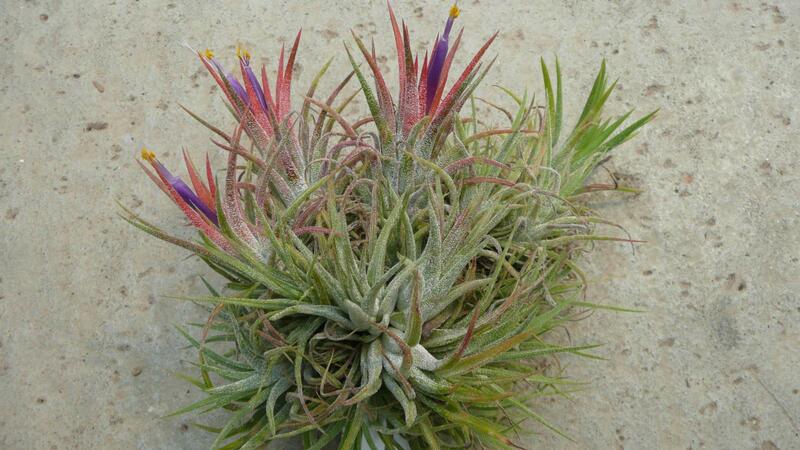 Tillandsia: For Dr. Elias Erici Tillandz (originally Tillander), Swedish physician and botanist (1640-1693). Leaves rosulate or distributed along a stem, polystichous or distichous, entire; inflorescence usually of distichous-flowered spikes or sometimes reduced to a single polystichous-flowered spike by the reduction of the spikes to single flowers or rarely the whole inflorescence reduced to a single flower. Vriesea: For Willem Hendrik de Vriese, Dutch botanist and physician (1806-1862). Leaves rosulate, polystichous, entire margins; inflorescence usually of distichous-flowered spikes, bracts generally conspicuous; ovarysuperior; plumose seeds; petals with appendage. Trichomes absorbant (except in some species of Navia). Rosette growth with spirally arranged alternate and simple leaves. Ovarysuperior (often inferior in Bromeliaceae). Leaves distichous (spiral in Bromeliaceae). Stamens 1 - 8 (6 in Bromeliaceae). Unisexual flowers (Bromeliaceae usually hermaphrodite). Leaves with the margins often spiny. Inflorescence frequently showy and bracteate. Flowers with 3 sepals, 3 petals, stamens 6, stigmas 3. The habit, types of fruits and seeds produced and the position of the ovary are directly related to the evolutionary level of these plants, and besides those characters, the margins of the leaves can be considered. These characteristics were used to separate the subfamilies. The subfamilies which have a superior or semi-superiorovary, such as Tillandsioideae (9 genera) and Pitcairnioideae (16 genera), produce rigid dehiscent capsules that open and release seeds through their own mechanisms. In this case the seeds are light and have appendages, or they are winged or plumose, facilitating wind dispersal (anemochory). In the Bromelioideae (31 genera) which have inferior ovaries, indehiscent fleshy berries are formed. These do not open spontaneously and thus require the collaboration of other agents, particularly animals (zoochory). This interaction seen in the Bromelioideae denotes a higher level of evolution. Bromeliaceae occupy a wide range of habitats and are one of the most characteristic elements of Neotropical forests. They occur from arid to very wet regions, from sea level to above 4,000 m in the Andes, and from rich volcanic soils to nutrient-poor white-sand savannas. 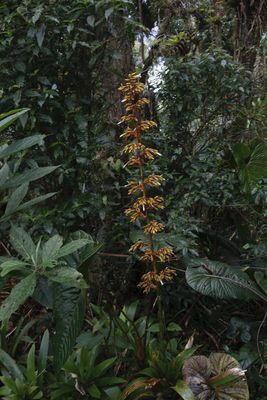 All of the large genera have broad Neotropical distributions with the exception of Puya, which is largely restricted to the Andes, and Dyckia, which is mostly found in southern South America. Eleven medium-sized genera have much more restricted ranges: Navia (90 species), Lindmania (38), and Brocchinia (20) are endemic to the Guayana Shield; Cryptanthus (54), Encholirium (31), Orthophytum (30), and Nidularium (45) are mostly found in eastern Brazil; Deuterocohnia (15), Fosterella (25), and Greigia (32) are most diversified in the Andes, with the latter two extending into montane Central America; and Hechtia (51) is found from southern Texas to northern Central America. Several genera such as Aechmea, Alcantarea, Billbergia, Bromelia, Cryptanthus, Dyckia, Guzmania, Neoregelia, Nidularium, Tillandsia, Vriesea are cultivated in urban areas (e.g. South-eastern Brazil, California and Florida, USA). 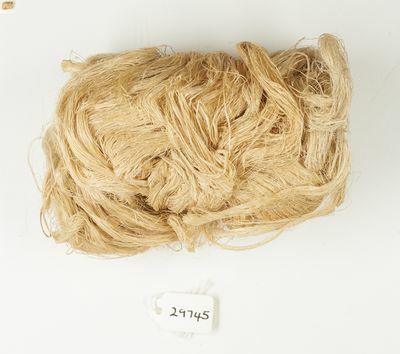 Most of the genera are cultivated in ex situ collections. According to the bromeliad binomials compiled by Harry E. Luther (2006), there are 3086 taxa among 56 genera. Encholirium Mart. ex Schult. f.
Brewcaria L. B. Sm., Steyerm. & H. Rob. Racinaea M. A. Spencer & L. B. Sm. According to Givnish (2007), the phylogeny, adaptive radiation, and historical biogeography of Bromeliaceae identify eight major clades in ladderlike fashion. The traditional subfamilies Tillandsioideae and Bromelioideae are monophyletic, but Pitcairnioideae are paraphyletic, requiring the description of five new subfamilies. 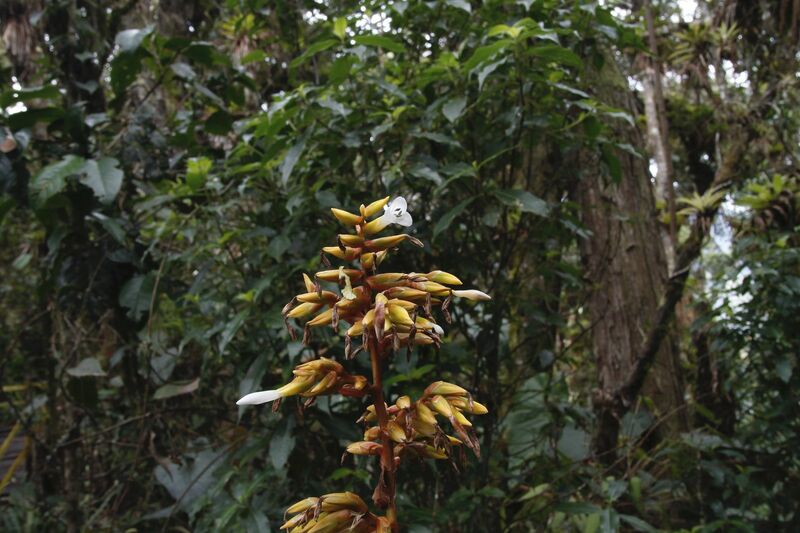 The genera Pepinia, Canistropsis, Edmundoa, Racinaea, Alcantarea and Werauhia listed in the bromeliad binomial (Luther, 2006) are treated as synomyms in the Monocot Checklist (Govaerts, 2009). These splits seem to have been made prematurely based on limited molecular evidence. 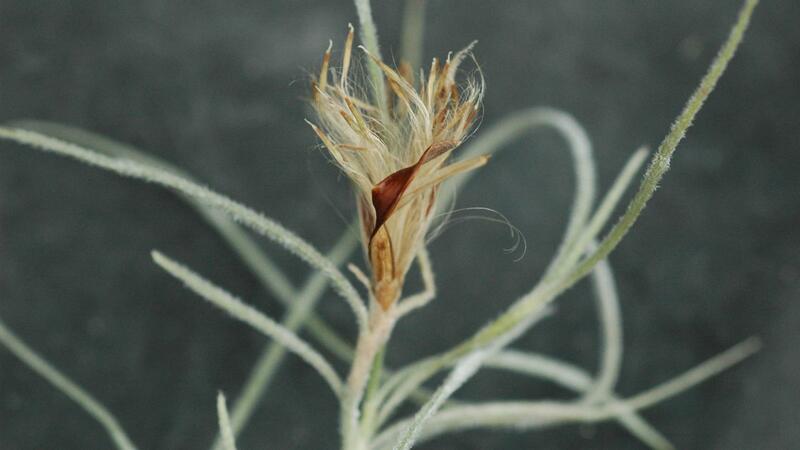 As more molecular research has been done, some of the splits seems to have been unjustified, like Pepinia (Grant, 2005) while others seem unnecessary like Racinaea, Alcantarea and Werauhia (Barfuss, Samuel, Till & Stussy, 2005). The Monocot Checklist has therefore taken a cautionary approach and refrained from accepting these genera until more compelling data become available. The pineapple (Ananascomosus (L.) Merr. 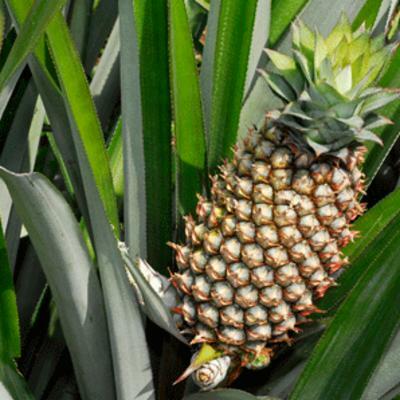 ), cultivated pantropically since the 1500s for its edible fruits, is by far the most commercially important species of Bromeliaceae. Several other bromeliads, particularly species of Aechmea, Bromelia, and Greigia, have edible fruits but are consumed only locally. The protein-digesting enzyme, bromelain, is extracted from pineapple fruits for use in meat tenderizers and as an anti-inflammatory. Aechmea magdalenae (André) André ex Baker, Ananas lucidus Mill., Neoglaziovia variegata Mez, and several Bromelia species, are, or have been, cultivated for the long, strong fibers in their leaves that are used to make hammocks, fishing nets, and twine. 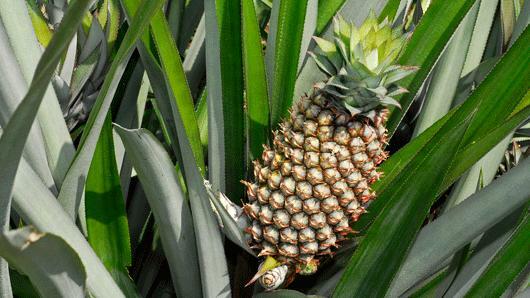 Bromeliads with strong foliar spines (especially species of Bromelia) are used as living fences. Horticulturally, the Bromeliaceae have achieved an important role in the speciality plant market and are now used widely for landscaping in warm climates or as houseplants in cold climates. Local people also use the plants or colourful inflorescences for decoration or religious ceremonies. Baensch, U. & Baensch, U. 1994. Blooming Bromeliads. Tropic Beauty Publ., Nassau, Bahamas. Barfuss, M.H.J., Samuel, R., Till, W. & Stuessy, T.F. 2005. Phylogenetic relationships in subfamily Tillandsioideae (Bromeliaceae) based in DNA sequence data from seven plastid regions. American journal of botany 92: 337-351. Benzing, D. H. 1976. Bromeliad trichomes: structure, function, and ecological significance. Selbyana 1: 330-348. Benzing, D. H. 1977. The structure of the bromeliad trichome. J. Brom. Soc. 27(4): 170-179. Benzing, D. H. 1980. The Biology of the Bromeliads. Eureka, California, Mad River Press. Benzing, D. H. 2000. Bromeliaceae: Profile of an Adaptive Radiation. Cambridge, U.K.: Cambridge University Press. Braga, M. M. N. 1977. Anatomia foliar de Bromeliaceae da campina, Acta Amazonica 7(3): -73. Gilmartin, A. J. & Brown, G. K. 1987. Bromeliales, related monocots, and resolution of relationships among Bromeliaceae subfamilies. Syst. Bot. 12: 943 - 500. Grant, J.R. 2004 publ. 2005. 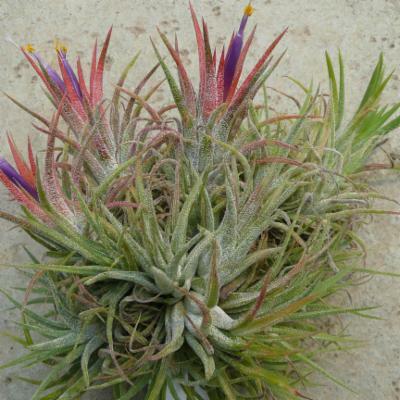 New combinations and names in Andrea, Pitcairnia, Tillandsia and Werauhia (Bromeliaceae). Vidalia; Revista da unidade de pesquisa e consevação de Bromeliaceae 2(2): 23-25. Heywood, V. H., Brummit, R. K., Culham, A., & Seberg, O. 2007. Flowering Plant Families of the World. Royal Botanic Gardens, Kew. Leme, E.M.C.& Marigo. 1993. Bromeliads in the Brazilian Wilderness. Marigo Comunicação Visual. Rio de Janeiro. Brasil. Luther, H. E. 2006. An alphabetical list of Bromeliad Binomials. Ed. 10. Bromeliad Society International, Sarasota. Manzanares, J. M. 2005. Jewels of the Jungle, Bromeliaceae of Ecuador. Part II. Pitcairnioideae. Quito, Ecuador. Imprenta Mariscal. Pp. 241-544. Oliva-Esteve, F. & Steyermark, J.A. 1987. Bromeliaceaes of Venezuela. Armitano, Caracas, Venezuela. Reitz, R. 1967. 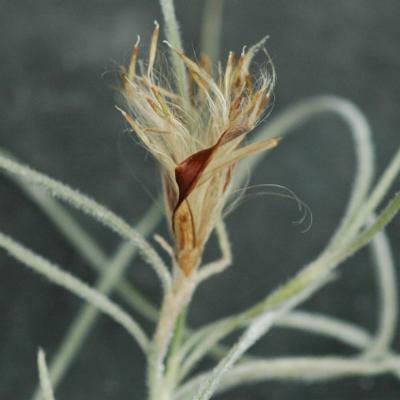 Raízes de Tillandsia usneoides (L.) L. Sellowia 19(19): 99-100. Wanderley, M.G.L. & Martins, S.E. 2007. Bromeliaceae. In: Flora Fanerogâmica do Estado de São Paulo 5: 1-476. Wanderley, M.G.L., Melhem, T.S., Martins, S.E., Jung-Mendaçolli, S.L., Shepherd, G.J. & Kirizawa, M. (eds.). Instituto de Botânica, São Paulo. Smith L.B. & Downs R.J. 1974. Flora Neotropica Monograph 14, part 1: Pitcairnioideae. Hafner Press, New York, New York, USA. Smith L.B. & Downs R.J. 1977. Flora Neotropica Monograph 14, part 2: Tillandsioideae. Hafner Press, New York, New York, USA. Smith L.B. & Downs R.J. 1979. Flora Neotropica Monograph 14, part 3: Bromelioideae. Hafner Press, New York, New York, USA. Strehl, T. 1983. Forma, distribuição e flexibilidade dos tricomas foliares usados na filogenia de bromeliáceas. Iheringia, Ser. Bot. 31: 105-119. Terry, R. G., Brown, G. B. & Olmstead, R.G. 1997. 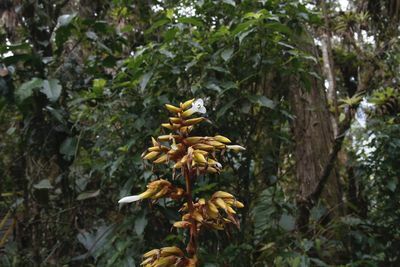 Examination of Subfamilial Phylogeny in Bromeliaceae Using Comparative Sequencing of the Plastid Locus ndhF. Amer. J. Bot. 84(5): 664-670.